Any cookbook which says, "if you don't like garlic or lemon, skip to the end of this book" is a match for me!! Maybe that's why my friend, Melissa, gave me Ottolenghi, for Christmas. Ottolenghi is a London-based chef known for his Middle Eastern dishes. I'm reading the book slowly, pouring over the pictures and imagining the delicious smells. This year I would like to focus on switching up my vegetable recipes, and Ottolenghi's take on Carrot & Peas felt like a good place to start. Begin by making the sweet sauce. Combine all of the ingredients in the list above (OJ, wine, cinnamon, anise) into a small saucepan. Bring to a gentle simmer and cook until reduced to about 1/3 of its original quantity. This step takes 20- 40 minutes for the flavors to develop and the sauce to reduce, so build that into your timing equation! Once it's been reduced (picture below), set aside.Preheat the oven to 450. Meanwhile, in a small frying pan toast the coriander seeds over high heat for a couple of minutes. 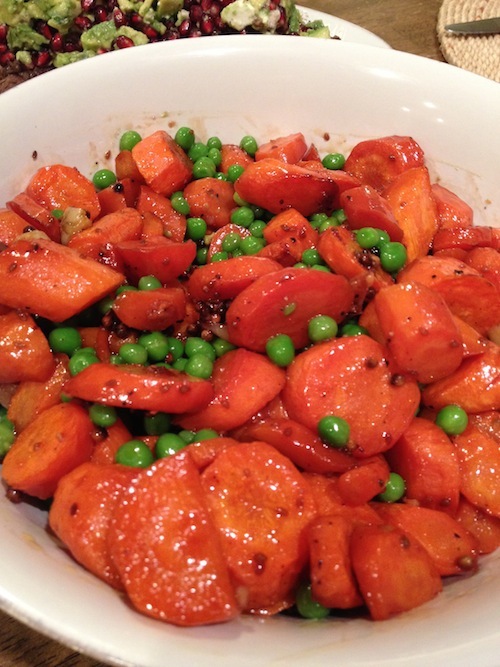 Put the seeds, crushed garlic, carrots, olive oil, salt and pepper in a bowl and stir together. My picture only shows the garlic and seeds, but you can imagine the carrots jumping in later, right? !Take the combined mixture and spread evenly on a baking sheet. Bake for 15 minutes.Remove the carrots then add the sweet sauce and stir. Return to the oven for another 7-10 minutes until the carrots are cooked through. 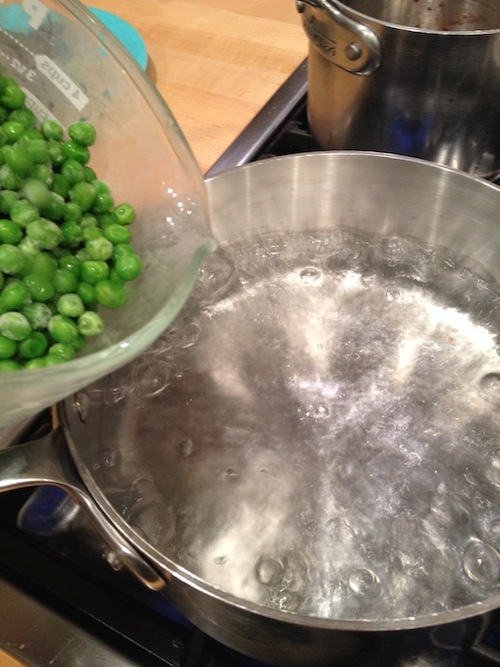 While the carrots cook, blanch the peas by putting them into boiling salted water for one minute. After they've cooked for a minute, drain and rinse with cool water to stop the cooking. No one likes mushy peas! !Gently toss together the peas with the carrots.. Adjust salt and pepper to your liking. If you're using the pea shoots, add them as the final thing!